Indianapolis North Central has produced its fair share of standout guards over the last decade. Since 1999, the school has produced a trio of Mr. Basketballs: Jason Gardner (Arizona), A.J. Ratliff and of course, Eric Gordon. 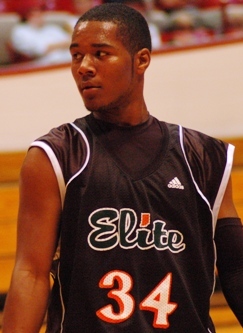 And a fourth could soon be on the way in the form of 2012’s D’Vauntes Smith-Rivera. A physical guard who is regarded as one of the top prospects nationally in his class, Smith-Rivera already holds a scholarship offer from the Indiana staff. And he plans to get more familiar with Bloomington over the summer. On his last visit, Smith-Rivera got a chance to see the campus and became more familiar with how Tom Crean sees him fitting in with the program. With three years of high school remaining, Smith-Rivera plans to take his time with the recruiting process. Although he plays mostly at the two at North Central, he doesn’t mind playing the one, two or even the three. Besides the offer from IU, Purdue and Tennessee have also offered and Smith-Rivera broke down the way he views the atmospheres at the three frontrunners in his recruitment. Scouting report: Smith-Rivera is fantastic at getting to the basket and more importantly, getting to the line. He’s good enough with the ball to play the point and also showed an ability to knock down the outside shot when left alone. Consider him one of the top priorities in Indiana’s 2012 recruiting efforts. I think there are many better guards in the class of 2012 that we can get. Just because he is from Indiana does not mean we have to get him. Look at Creek. Just my opinion. Smith-Rivera is definitely a point guard. I watched several North Central games this year and whenever he was in the game he brought the ball up. Terone Johnson is a stellar Purdue recruit, and at times he would bring it up as well, but I'd categorize Smith-Rivera as a 1. His jumper, although accurate when open, isn't quite there yet to be a true 2.